We have carved a niche as the prime manufacturer and supplier of a comprehensive array of Nylon Thread that is fabricated using 100% continuous Nylon 6 (Polyamide 6) yarn. Our Nylon Thread is widely demanded by the clients. And, this thread can be availed at the most economical price. To maintain the quality standards of our company, we provide a quality assortment of Nylon Threads. The offered sewing thread is manufactured using the best quality fiber and advanced technology in adherence with industry norms. Our quality examiners test this sewing thread on different quality measures so as to offer qualitative product to our clients. 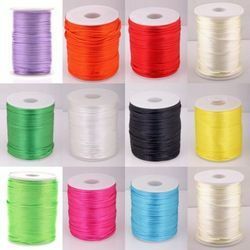 Apart from this, provided sewing thread is available at industry leading prices.